One of Britain's rarest orchids could soon be flowering on a military firing range, conservationists hope. 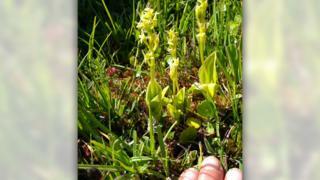 The internationally protected fen orchid grows in the wild in only two locations in the UK. Now a wild-flower charity is hoping to lure the orchid back to Pendine dunes, Carmarthenshire - 17 years after it became "extinct" in the area. Colin Cheesman, of Plantlife, said: "It's vital we take action or [the] species could be lost forever." A testing site for the armed forces may seem the last place for a dainty and protected flower. But work has begun to clear grasses and shrubs from Pendine dunes to restore the open sands and give the small wetland flower a fighting chance to grow. Plantlife's head conservationist Mr Cheesman said the particular fen orchid that grows in sand dunes was unique to south Wales. "This is about protecting part of our natural heritage," he said. "Diggers may look aggressive but they are clearing away the choking grasses, to encourage it back to flower or we can seed-in. "The dunes were once home to the fen orchid but this has become extinct as the dunes became overgrown." Similar work by the charity at Kenfig Nature Reserve, near Bridgend, saw the fen orchid population increase from just 40 to 1,500 in five years. The only other place in the UK where it grows wild are the fens of East Anglia. While the clearing work will soon be complete at Pendine, orchids grow slowly so it will take a few years before the flower lights up the dunes. Mr Cheesman added: "Over the coming decade we expect swathes of orchids and other rare plants to re-colonise lost ground, bringing colour to the dunes, and restoring the Carmarthen dunes to its former glory." Listen to more on this story on BBC Wales Country Focus.